A few years ago we had our first large family gathering at our house In Nenagh. There were family members and friends travelling from Mayo and Galway and we were cooking a meal to be served in a small marque in the very small back garden. Just before we left the house to meet everyone at the ceremony, ‘he who shall not be named’ (as we live in a no-blame house) turned on the oven to start the roast. We were cooking a marinated loin of pork off the bone with rind on that was left directly onto the middle shelf of the oven, with a tray on the shelf below containing the roasting bones to make a delicious stock for gravy. We then headed off, happy in the knowledge that everything was cooking away in our absence. We arrived back from the ceremony with gang in tow to find a crowd standing, looking at the house that was quickly filling with smoke with alarms blaring. We nervously opened the door to find that the house was not on fire but that ‘he who shall not be named’ had turned on the grill full blast instead of the oven so we had perfect crackling sitting on top of raw pork. The meal was eventually cooked but we were truly exhausted at the end of it. We decided that day that any gathering we were to cook for would be one of stress-free convenience. We usually go for cold cuts that can be roasted the day before with a variety of colourful different salads. It works well. A lot of people come into the shop at this time of communions and confirmations wondering about how to cook joints of meat for either serving warm or as cold cuts. Our favourite cold dish is beef served on sourdough bread with a dollop of homemade horseradish. 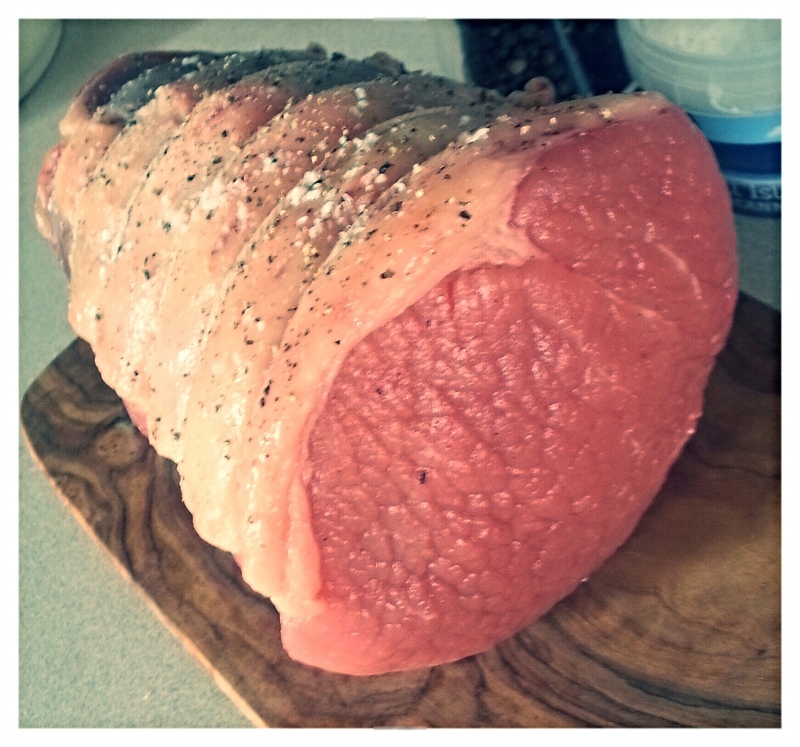 The best joint of beef to use for large groups are roasts such as the eye of the round, topside or silverside because these joints are tidy to slice. But the one issue with these particular joints is that they are too lean. It is very important for roasting that there is enough fat on the meat to prevent it from drying out and to caramelise the surface. Fat is essential for the perfect roast. Contrary to popular belief the fat found in well-reared grass-fed beef is good as a lot of it is a monounsaturated fat called oleic acid, which is the same heart friendly fat that’s found in olive oil. Also, most of the saturated fat in beef actually acts to either lower LDL (or bad) cholesterol or by reducing your ratio of total cholesterol to HDL (or good) cholesterol. But if fat on beef is still not to your taste using it for roasting beef doesn’t mean that you have to eat it. At the end of the roast, solid fat can be cut off or liquid fat poured away. For joints such as the eye of the round, your butcher should provide you with some beef suet or pork flair fat to bard your joint with. Without this treatment, it will not roast well. Once you have your cut of beef, barded if required, the next important requirement is the correct cooking time for how you like your beef. These cooking times apply to beef that has been allowed come to room temperature fully i.e. left out of the fridge for at least one hour or more, depending on size. I cook it uncovered in a suitably sized roasting tray seasoned with sea salt and black pepper. Preheat oven to 230⁰C or Gas Mark 8. Sizzle time: 20 minutes for up to 2kg; 30 minutes for 2 – 3kg; 40 minutes for over 3kg at 230⁰C. Reduce temperature to 160⁰C or gas mark 3.